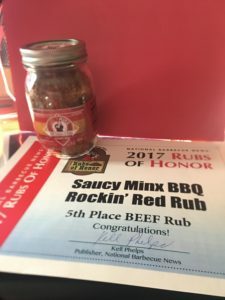 Way back in September or so, I found a Rub of Honor contest through National Barbecue News. A periodical newspaper that I get associated with National Barbecue Association. An organization I joined to stay up to date on BBQ across the country. With this they were awarding certificates for the 10 best rubs in Beef, Chicken, and Pork. So I entered a few of our products to them for the contest to see how they stood up against others around the country. So off I send my samples entering our Rockin’ Red in Beef and Pork, our Cheerin’ Chipotle Mocha in Beef, and Tantalazin’ Tex-Mex in Chicken and Beef. Well, they really liked the Rockin’ Red and it placed 5th in Beef! A few days ago the certificate came with how all the samples fared, and those judges in Georgia had some hard work trying all the samples submitted. there were 48 submissions for Beef, 52, for Chicken, and 59 for Pork. So for ours to get recognized was incredible. We even bear our all of Rufus Teague rubs and Sucklebusters in the beef category which is HUGE for us, as those are nationally recognized brands. Our others did not make the top 10, but they still held their own against products across the country. We are very proud of our products and will continue to make sure that we continue to grow and share what we do with everyone we can. Our little company in Oregon is just beginning to make a splash in the BBQ world.